David Rockwell's star turn at the Oscars last year won the designer considerable plaudits, so he's been asked to reprise his role, according to UPI. "We loved the look and feel that David created for the Oscar show last year," one of the producers said. "David is so creative and has such a great big-picture approach to set design," said another. The well-known interiors ace has done considerable amount of work on Broadway as well as the Kodak Theater where the Oscars are taped, so really, it's like a homecoming. An elementary school has opened on the site of the old Ambassador Hotel, the first of three. It’s only been about three years since Myron Hunt’s Mediterranean-style Ambassador Hotel—home of the Rat Pack, the Oscars, and, more somberly, the shooting of RFK—was unceremoniously torn down. But already, out of its rubble the skeleton of a major new school complex is rising. With an elementary, middle, and high school, the Central LA Learning Center No.1, as it’s called, borrows much of its form from the immense Ambassador Hotel whose decorative fittings were sold at a public auction in September 2005. On the south end of the complex, the first phase, the new elementary school, opened its doors to 800 K-5 students on September 9. The two-story, 92,000-square-foot project was designed by Pasadena-based Gonzalez Goodale Architects, who are working on all three new schools in the 4000+ student complex, which share cultural and athletic facilities. The school is unusually transparent for its urban setting, though suffused with light as a result. Considering its historic site, the K-5 school is notably contemporary, hinting at a new direction for the LAUSD and a focus on modern design throughout its multibillion dollar bond program. 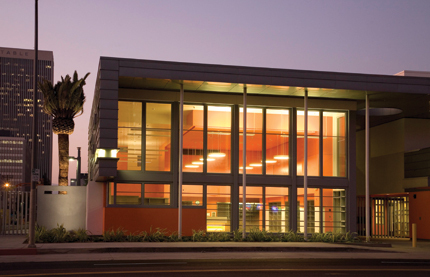 “We’re helping create a new image for the LAUSD,” commented project architect Chung Chang. 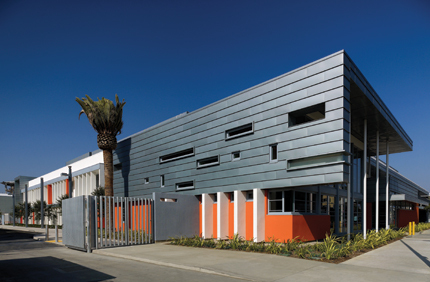 The building is clad throughout with dark zinc paneling—which wraps around most of its corners—offset with painted plaster and perforated metal flashes of orange, gray, yellow-green, and white. Inside a lofty entrance portal, the school stresses transparency and connection: Most of the public spaces are open air, including outdoor hallways, an exposed grand stair, open flanking stairs, al fresco cafeteria seating, and skylit canopies. The east and west branches of the school are connected by two large courtyards. Circular skylights and perforations above provide more exposure. Behind that large curtain wall is a double height library. 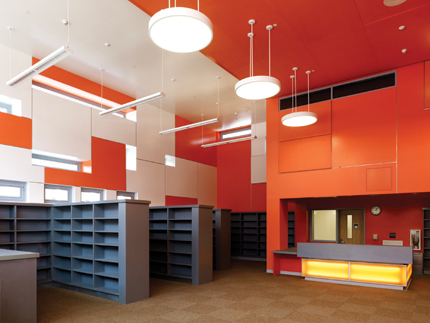 The double-height library, patterned in colorful orange and white and fronted with a large glass curtain wall, is the most dramatic public space in the school. Meanwhile, on top of the parking lot is a large track and playing field, which will be shared with the adjacent middle school. Public art pieces like murals and a large mosaic embedded into a play area add decoratively instructive touches. The K-5 school, which houses two pilot schools—the NOW Academy and the UCLA Community School—literally looks up to the middle and high schools, which are several feet higher in grade. Those will be finished next fall. 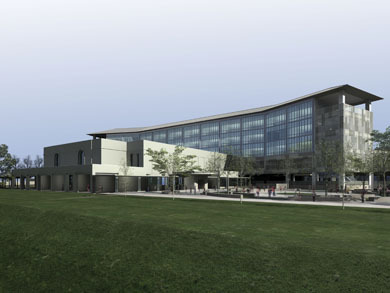 Much of the middle school’s exterior features similar wraparound zinc panels, while the 2,440-student high school is shaped to echo the form of the Ambassador, with its monumental entry and angled wings. Finishes, however, will be contemporary, highlighted by a multi-floor glass curtain wall that will allow onlookers on Wilshire Boulevard to see into the classrooms in use. The school auditorium will take the same dimensions of the former Cocoanut Grove nightclub, incorporating that classic club’s eastern wall and one of its original canopies. As they prepare for future events, administrators will perhaps be challenged in a good way to compete with the ghosts of a past that once inhabited the nightclub. A version of this article appeared in AN 08_10.28.2009_CA. As you're dazzled by light refracting off one million Swarovski crystals at a very Rockwellian Oscars this evening, there'll be one award worth watching besides the Mickey Rourke vs. Angelina Jolie faceoff for Biggest Lips. Up for best documentary feature is The Garden, the story of a 14-acre community garden in South Central that was the largest of its kind...until it was bulldozed in 2006 by developer Ralph Horowitz to make way for a Forever 21 warehouse. Since 2006 the plot has sat vacant while the 350 families locked out of their plots have mounted a massive campaign to combat the warehouse and boycott the retailer. Local residents have even accused project supporters City Councilwoman Jan Perry and Mayor Antonio Villaraigosa of corruption; last year, the mayor recieved at least $1.3 million in donations from the fast-growing retailer and even took the company's founders on a trade mission to Asia in 2006. This weekend, protests at Forever 21's Pasadena location seemed like bittersweet promotion for the documentary, which is currently making the festival rounds. We'll be pulling for the film—and the displaced farmers—tonight. Update: The Garden didn't win, but that's okay with us because another architecturally-significant film, Man on Wire, about Philippe Petit's tightrope walk between the World Trade Center towers, did. After accepting the award, Petit balanced the Oscar on his chin. 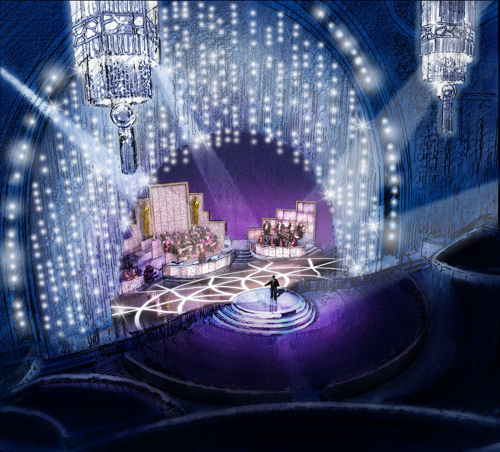 Possibly channeling a youth well spent watching late night reruns, David Rockwell envisioned a stage set for the 81st Academy Awards straight from the dazzling finale of 42nd Street wherein a woman's face dissolves into a crescent moon. And that would be almost as surreal as David Rockwell incorporating some paving ideas from the Piazza del Campidoglio. Over the weekend, I caught a screening of Burn After Reading, which turned out to be better than the reviews would have you believe. But the biggest surprise was the trailer for The International. Watching the opening scene, you're probably thinking the same thing I did: The financial crisis, coming to a theater near you. But beyond the (once?) absurd plot of a the world's largest bank funding murders and coups, the movie looks like it could be the most architecturally savvy since The Fountainhead. To wit: The opening scene (of the trailer--the movie's not out until next February, no doubt in time for the Oscars) is a shot of Cass Gilbert's Woolworth Building, once the city's tallest and still one of its most recognizable. While countless movies open with aerial shots of skyscrapers both recognizable and not--Wall Street, Ground Hog Day, in the near future Blade Runner--few so lovingly embrace iconic buildings, both new and very old, in the way The International does, or at least seems to. From the typically non-descript post-post-modern glass towers of modern finance to more refined and identifiable landmarks like Zaha Hadid's Phaeno Science Center and the Blue Mosque in Istanbul, architecture approaches a fetishitic level in the film/trailer. (Limited edition AN tote bag to the first reader who can actually identify the seemingly contrived headquarters/rendering at the 0:47 mark. Leave a comment if that thing is for real.) All this high level design could simply be a reflection of the zeitgeist, as bold-face architects like Hadid and Frank Gehry have become ubiquitous marketing brands in recent years. How then to explain the film's most shocking architectural gesture: a shoot out in Frank Lloyd Wright's Guggenheim Museum. Just as director Tom Twykers (of Run Lola Run fame) picked the perfect moment to launch a movie about an evil bank-- whether he knew it or not--maybe he also was right on the mark in heralding the death of high design. Or maybe it's just a movie trailer. Check back in a few for a full report. In late December the Los Angeles Conservancy and the Los Angeles Unified School District (LAUSD) reached a settlement in their longstanding battle over the historic Cocoanut Grove Night Club, a Los Angeles icon that had been a vital component of the now-demolished Myron Hunt-designed Ambassador Hotel since it opened on Wilshire Boulevard in 1921. The result: the Conservancy will allow the LAUSD to demolish the Grove and replace it with a replica using new materials and containing an auditorium and lounge for the Central Los Angeles New Learning Center #1. 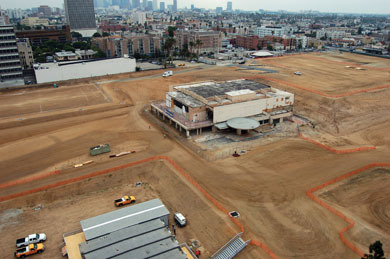 The 4,000-plus student complex under construction is on the site of the Ambassador Hotel, which was dismantled in 2005. In return the LAUSD will contribute $4 million toward the Historic Schools Investment Fund, which provides grants to help repair and restore historic LAUSD schools. The cabaret-style, tropical-themed Grove, which was remodeled in the 1970’s, had welcomed performers like Bing Crosby, Barbra Streisand, Frank Sinatra, and Sammy Davis, Jr., and had even hosted the Oscars. Along with the Ambassador, it had eventually fallen into disrepair and the LAUSD gained ownership of the buildings in 2001. In 2004 the LAUSD board voted to dismantle the Ambassador in favor of the new complex, designed by Pasadena-based Gonzalez/Goodale Architects, but opted in its final impact report to preserve and reuse the Grove and its adjacent Paul Williams-designed coffee shop. That plan was scrapped earlier this year when the District’s engineers noted that the building lacked “integrity and seismic stability,” said the new school’s project manager John Kuprenes. 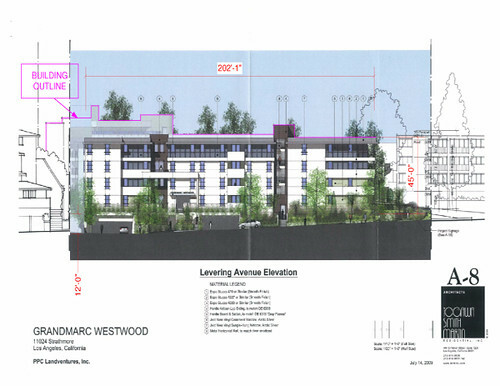 The LAUSD board then approved an additional environmental impact report on September 25 of last year, with a plan to tear down the Grove and rebuild it in the same dimensions using newer materials. The Conservancy had organized an injunction on December 7 to stop demolition of the Grove, arguing in an October 25 lawsuit that the LAUSD’s claim that the club was “technically infeasible” to maintain had not been clearly proven. A court date to decide the building’s future had been set for February 25. But in a statement the Conservancy said it decided to give up the fight due in large part to the “increasing realization that true preservation of the site’s remaining resources had become impossible due to what had already been lost.” Much of the Grove had already been damaged by LAUSD construction crews and looked like a shadow of itself sitting alone in the Learning Center’s construction site. The Conservancy will also drop its effort to save the Ambassador Hotel’s pantry—where Robert Kennedy was assassinated—which is now housed in pieces off-site. The other, perhaps more important, factor was the District’s agreement to donate $4 million to the Historic Schools Investment Fund. That fund, administered by the California Community Foundation, was established in 2005 with $4.9 million in settlement funds from the 2004 lawsuit over the Ambassador Hotel’s demolition.